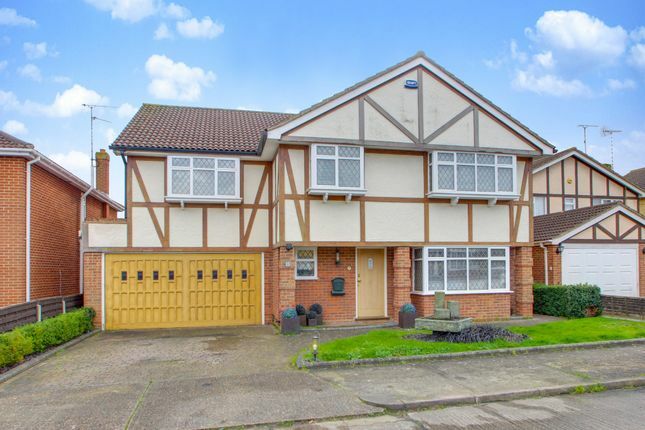 Williams & donovan are delighted to offer for sale this imposing five bedroom detached house situated within the highly sought after Chase Development and within catchment for the ofsted outstanding King John School. This property has been extended and benefits from having a 33' 6" family room/orangery overlooking the rear garden, 19' lounge, kitchen, utility room, en suite to master bedroom, double garage and 45' south backing rear garden. Must be viewed internally to fully appreciate the accommodation on offer. Entrance via obscure solid wood door to reception hallway. Reception hallway 19' 10" x 9' 4" (6.05m x 2.84m) Coving to textured ceiling. Stairs to first floor accommodation. Radiator with decorative cover. Karndean flooring. Ground floor cloakroom 5' 7" x 3' 2" (1.7m x 0.97m) Obscure uPVC double glazed window to front aspect. A two piece white suite comprising wall mounted wash hand basin and close coupled wc. Textured ceiling. Part panelled walls. Radiator with decorative cover. Continuation of Karndean flooring. Dining room 12' 6" x 12' 5" (3.81m x 3.78m) UPVC double glazed lead light bay window to front aspect. Coving to skimmed ceiling. Radiator with decorative cover. Utility room 8' 5" x 8' 4" (2.57m x 2.54m) UPVC double glazed lead light window to rear aspect. UPVC double glazed lead light door to rear aspect. Coving to skimmed ceiling with spotlight insets. A range of base level units incorporating granite working surface and matching up stands. Inset sink with freestanding mixer tap. Space for washing machine and tumble dryer inside cupboard. Clothes airer inside cupboard. Radiator with decorative cover. Continuation of tiled flooring with decorative wooden inlay. Door to garage. Family room/orangery 33' 6" x 12' 4" (10.21m x 3.76m) Vaulted ceiling. LED lighting. Three sets of uPVC double glazed bi-fold doors with integral Venetian blinds providing access to rear garden. 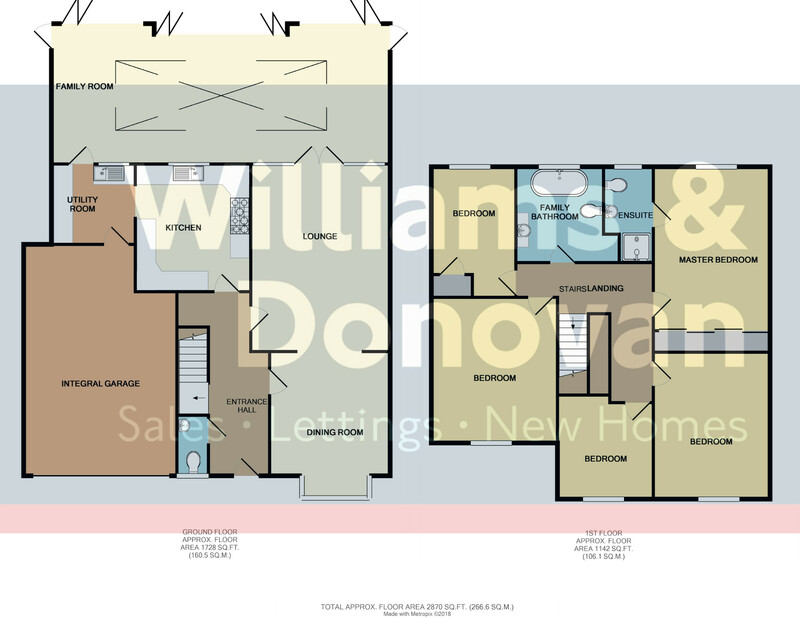 Two doors to left and right flanks with integral Venetian blinds. Air conditioning vents to ceiling. Fitted blinds to sky lantern. Karndean flooring floor with under floor heating. En suite shower room Obscure uPVC double glazed lead light window to rear aspect. A three piece white suite comprising walk in shower cubicle, designer wash hand basin and close coupled dual flush w/c. Coving to skimmed ceiling. Part tiled walls. Tiled flooring. Chrome heated towel rail. Bedroom two 14' 5" x 12' 8" (4.39m x 3.86m) UPVC double glazed lead light bay window to front aspect. Coving to textured ceiling. Radiator with decorative cover. Bedroom three 15' 1" x 12' (4.6m x 3.66m) UPVC double glazed lead light window to front aspect. Coving to textured ceiling. Radiator with decorative cover. Bedroom four 19' 5" x 9' 8" (5.92m x 2.95m) UPVC double glazed lead light bay window to front aspect. Coving to textured ceiling. Radiator with decorative cover. Bedroom five 14' 3" x 8' 5" (4.34m x 2.57m) UPVC double glazed lead light window to rear aspect. Coving to textured ceiling. Built in storage cupboard. Radiator. Laminate wood effect flooring. Luxury bathroom UPVC double glazed lead light window to rear aspect. A three piece white suite comprising freestanding bath with designer shower surround, vanity mounted wash hand basin and high level wc. Coving to skimmed ceiling with spotlight insets. Two designer heated towel rails. Part tiled walls. Tiled flooring. Exterior. The rear garden is south backing and measures 45ft x 32ft (13.72m x 9.75m) commencing with raised decking area with sunken hot tub. (Agents Note: The hot tub requires maintenance). Pergola to remain. Various raised flowerbeds with established flowers, shrubs and trees. Storage shed to remain. Fencing to all boundaries. Further integral storage area at rear housing wall mounted combination gas boiler. Gate providing access to front. double garage 21' approx x 16' 8" approx (6.4m x 5.08m) With electric up and over door. Base and eye level units. Power and lighting. Internal door to utility room. Lawn area with small flowerbeds. Slate chipped area with water feature.